a brand name of a young yet experience creative enthusiasts, which devoted to transform great ideas into every aspect of your brand. We pioneer the innovative use of modern technology to deliver powerful, creative and user-friendly solutions across a wide range of media. As a designer, planner, builder, we create brand identities with our unnatural ability, providing our clients with carefully planned and insightful design solutions that deliver professional project on time, and giving satisfaction to our clients. Our emphasis is very much on creativity and most importantly, on making things work within a cost effective budget. 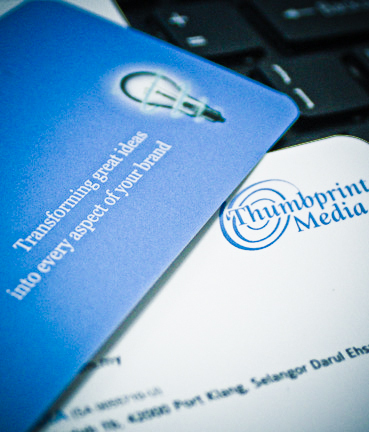 © 2007-2011 Thumbprint Media. All rights reserved.